Harvest time. It's that moment we are all working towards all year, after all that sowing, tending staking and watering. When we finally get to pick the fruits of our labour. I decided last October that I had to cut back on how much veg I try to grow, as from an ME perspective, I was struggling to manage everything. As ME has fluctuated throughout the year, so has my ability to garden, particularly in the last 3 months. However, some of the work I did when I was feeling better has paid off and I've been enjoying wonderful fresh food from the garden since June. I love Broad Beans. 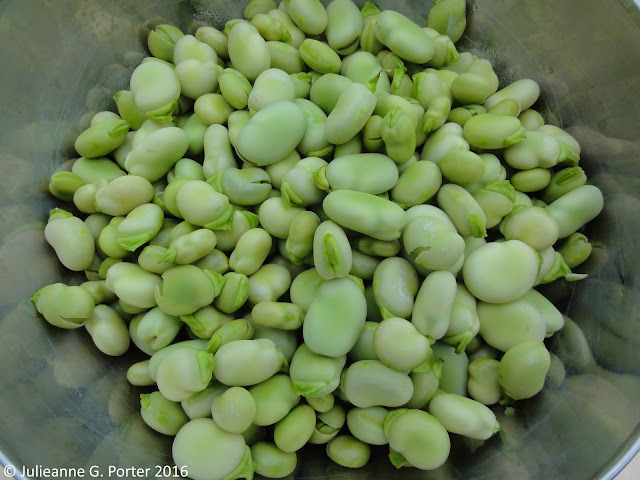 I adore Broad Beans. They are quite possibly my favourite vegetable. They are also one that isn't so easy to get fresh from the shops, so it's a good one to grow if you have the energy. They have a Spoonie Veg rating of 2-3 (I'll do a Spoonie Veg post on Broad Beans in Autumn) as they require a little more looking after. Mainly staking, as my garden is quite windy being two thirds the way up one of Sheffield's rather big hills. And there is also the dreaded black fly. I manage the latter by having a squirt bottle with washing up liquid and water at the ready at all times. As soon as I notice the black fly, I basically drown them. Do it twice a day for a couple of days and it's 1 me, black fly 000. Because of the cold Spring I had some problems with germination and then they took quite a bit of time to get growing. 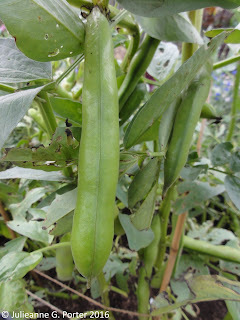 I also didn't get around to sowing these until mid-March, however I still got a great crop from a 1.5 x .75 bed of beans. This amounted to approximately 18 meals, which I think is pretty good going from such a small space. 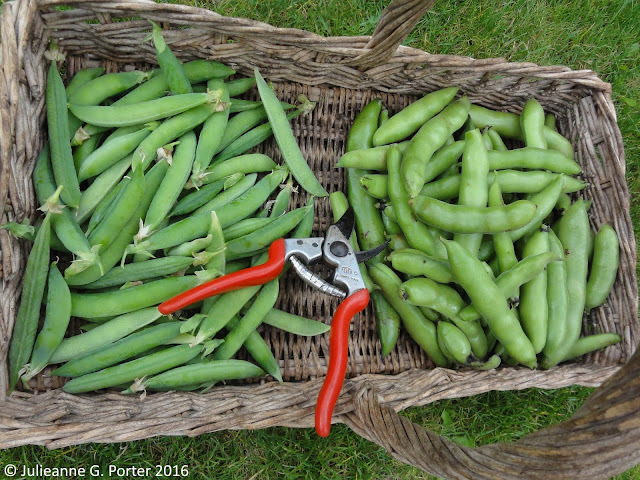 I grew a mix of standard and dwarf Broad Beans, but it was the standard ones, Bunyards Exhibition and Super Aquadulce that did best. I think the taller beans over shadowed the dwarf ones, The Sutton, too much, despite planting the dwarf ones in front where they would get the most sun, which is why I think the crop from them was poor. If I have the energy, I'll try growing the dwarf ones in pots next year. I started harvesting them in late June (usually you would earlier, but the cold Spring held things up by several weeks) and have made a variety of dishes from them. This includes: Broad Bean and Feta Salad, Broad Bean, Bacon and Mint Penne pasta (this works just as well with French Beans), and Broad Bean Risotto. 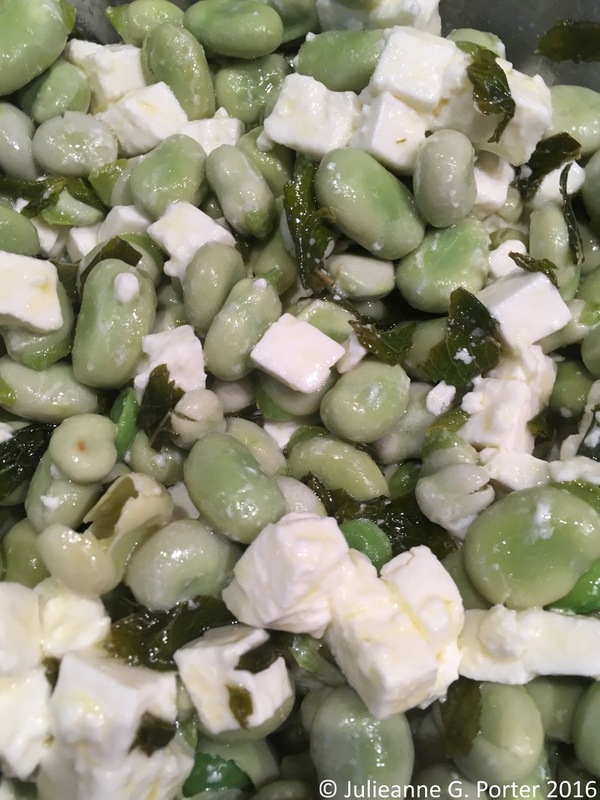 When I say Broad Beans are possibly my favourite vegetable, I'm also thinking of Garlic, which I also adore and which is incredibly easy to grow. Garlic has a Spoonie Veg rating of 1; I'll be publishing an individual Spoonie Veg post on Garlic in a couple of weeks. 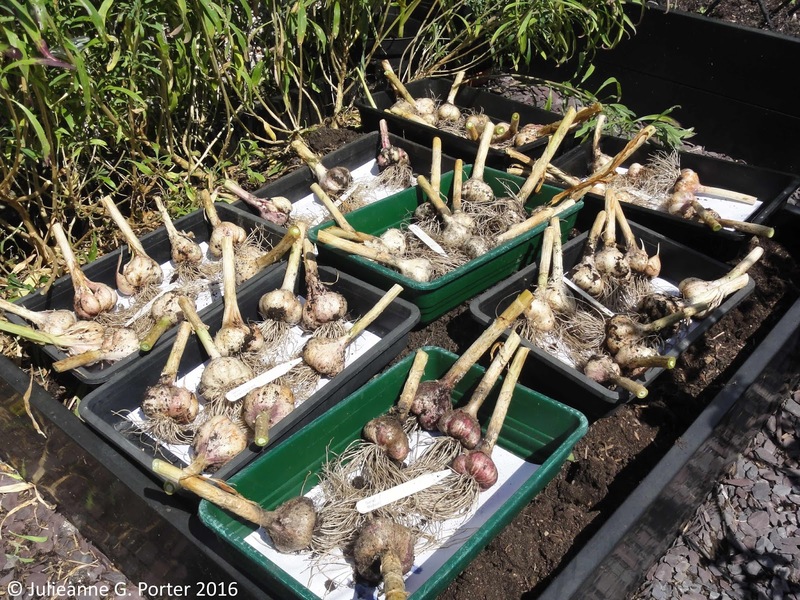 For garlic, sow the cloves in late Autumn, do nothing until around mid Spring (depends on the weather) when you need to just make sure they are watered if it is a dry Spring and Summer. Cut off the garlic scrapes when they form (late May-early June). Then harvest. That's it. Ok, maybe slightly more is involved than that, but you get the drift. I grow Hardneck Garlic, that forms a scrape from which you can make Garlic Pesto. Although it's not meant to store as well as Softneck Garlic, I don't find much difference if you store them properly. I use garlic in everything. This is in part because I'm allergic to onions (I know, same family, don't ask) so garlic is my substitute. 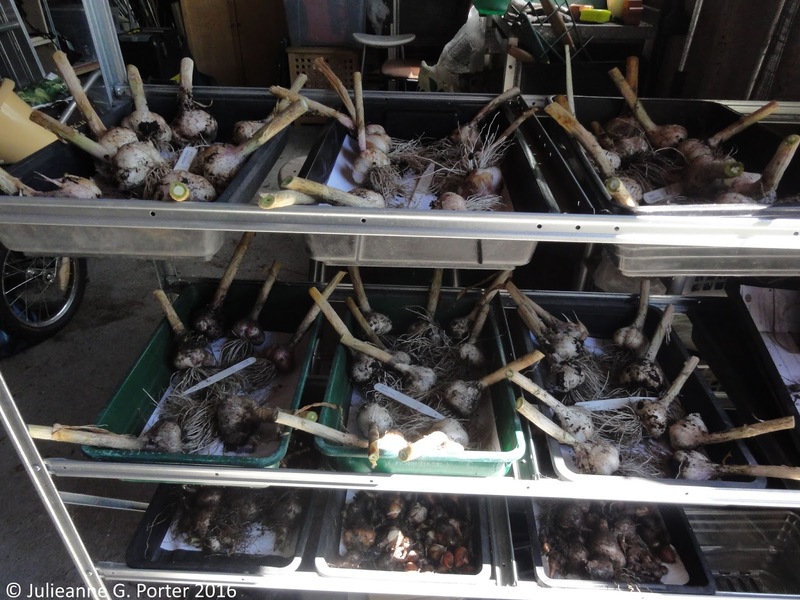 And when you compare growing the two... Garlic: plant a clove, end up with a full bulb. Onions: plant a small bulb, end up with just a bigger bulb. So even without being allergic to onions, you can see that you get a much higher yield from garlic. Most of my crop did really well this year and what you see below is enough for two people for a year, for saving some to grow next year, and to pass some on to others to grow. Not bad for so little work. After a few hours in the sun (previous picture), I then dry my garlic out in the garage. I didn't grow as many peas as I usually do as I wasn't up to the extra work they entailed. So this year I only grew heritage Pea 'Robinson'. The other I regularly grow is heritage Pea 'Latvian', which I'll grow again next year. 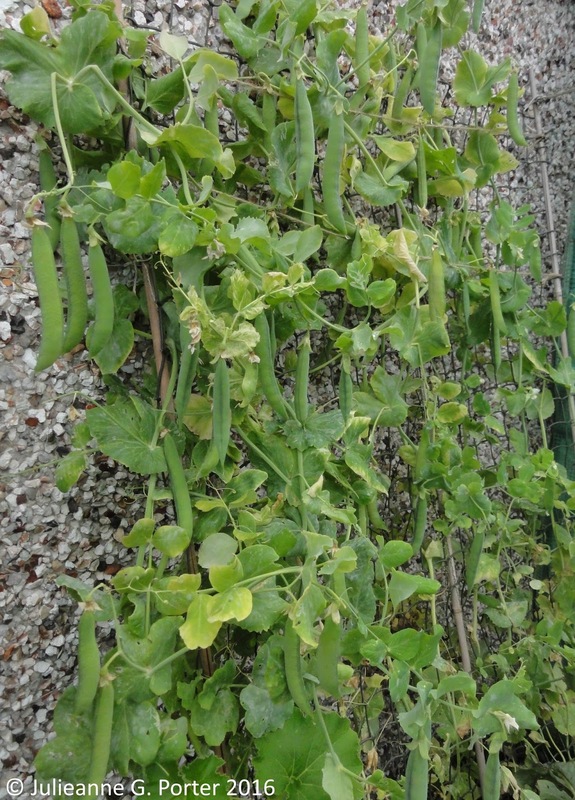 'Robinson' (right picture) is a tall pea, close to 1.5 metres, so needs something to grow up. 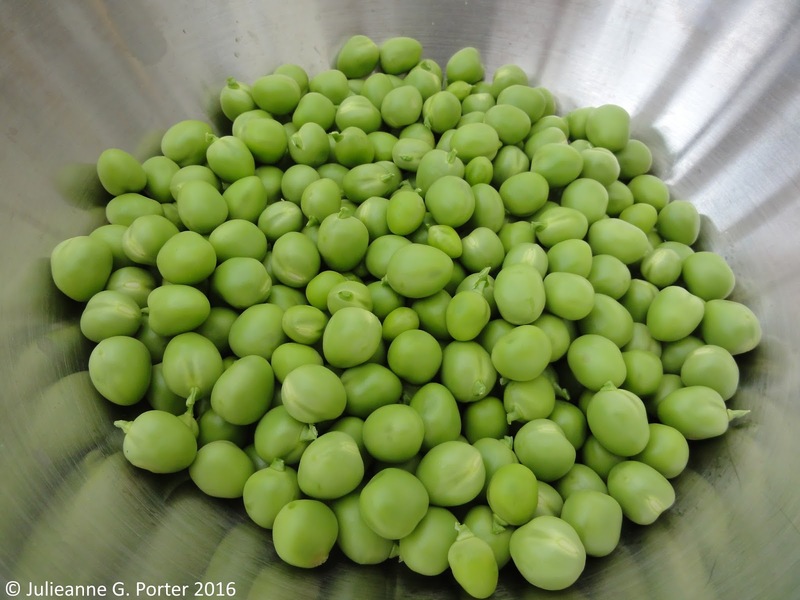 I think Peas are a bit more work compared to Broad Beans, and I don't think you get as much for your efforts. Peas have a Spoonie Veg rating of 3. Fresh peas taste amazing, and again aren't something so easy to get in the shops. So if you have the energy, the flavour can be worth the extra work. I sowed about 15 seeds and ended up with enough to go in a dish for 6 meals, plus plenty left over from which I can save seed. They do need a bit of watering and I find it doesn't matter what you grow them up, you still need to do some tying in. 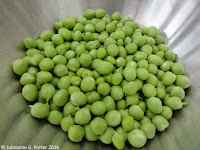 I would like to try growing some dwarf heritage peas to compare them too. So if you know of any, let me know. Because I often cook in batches, this year I made a big batch of Pea and Broad Bean Risotto, enough for the two of us for three nights. The risotto is amazing on the first night, though the quality lessons slightly on subsequent nights, but it's still pretty good. When you have ME, you are not always up to cooking. Hence I cook a large batch of something, risotto, curry, that being my only job for that day, so the next two days I can rest and maybe do something else. Like gardening. Ahhh, courgettes. That versatile vegetable that just keeps giving. And giving. I'm not too fussed about courgette gluts as I'm always happy to make large batches of soup that I can freeze and eat in winter. Courgette have a Spoonie Veg rating of 2, the main efforts going to sowing and potting on, then watering and feeding through Summer and Autumn. This year I decided to grow round courgettes, Tondo di Piacenza from Real Seeds. The website says they are very productive and I can confirm this. From two plants I've already made enough Courgette and Brie soup for 12 meals and a delicious stir fry for 4 meals. And the plants have only just started to take off. 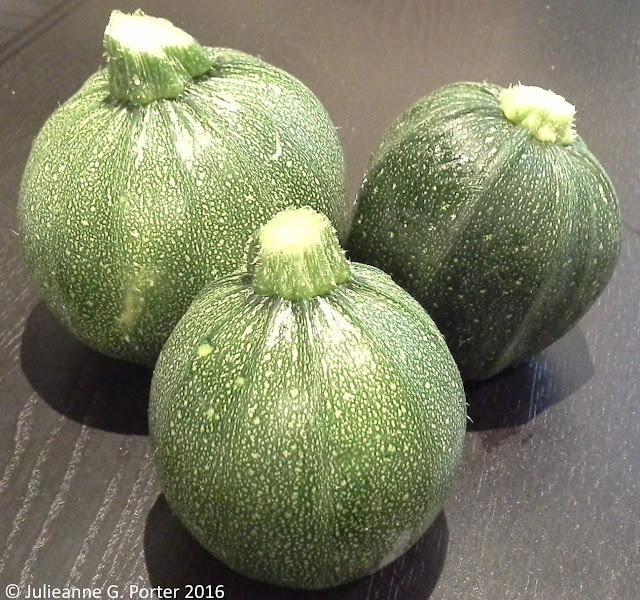 Like the usual long courgettes, they go from tiny fruits to monsters within a blink of an eye. I founds the flavour to be just as good, though I manage to pick the large ones before they turned into the aforesaid monsters. Any monsters will be turned into more soup. Tondo di Piacenza - not only prolific, cute too! I have also just started picking Dwarf French Beans, and will have some Beetroot (I sowed late), parsnip, carrots and Fennel bulbs to come soon too. And there is also my patch of Sorrel which is getting larger and larger by the week, and the Strawberries I harvested back in June. I'm hoping for some pumpkins, but unless we get some ongoing warm sunny weather in September, I'm not sure they will amount to much. Reflecting on what I've been harvesting so far this year, I'm pretty happy with the results. I had hoped to sow and grow more things from mid-Summer, but since June my ME has been pretty bad and I've had to spend a lot more days in bed than out of it. I therefore decided not to try and grow any further veg this year (until late autumn when I sow the garlic again) to reduce the workload in the garden. The ornamentals have been doing fine on their own, such as the Crocosmia in the top picture, but even they are starting to look like they could do with some tending. So I've decided to focus my limited energy there for the next couple of months. Because I see enjoying the flowers as a 'harvest' too. A feast for the eyes. Gardening with ME isn't easy. Sometimes you have to let a crop grow, as I did with my climbing beans last year, and sometimes you aren't well enough to sow anything. But what I can sow and grow, gives me so much joy. I love being in the garden, tending the plants and enjoying the sun and birdsong. And what I do get to harvest, not only feels like a great achievement, but also gives me incredible pleasure. Plus, of course, is the yumminess factor. Beautiful harvest, I am so sad that I did not grow any broad beans this year. I love them fresh. By the way, what is the name of those orange flowers, my neighbour has some and they are creeping into my garden too. 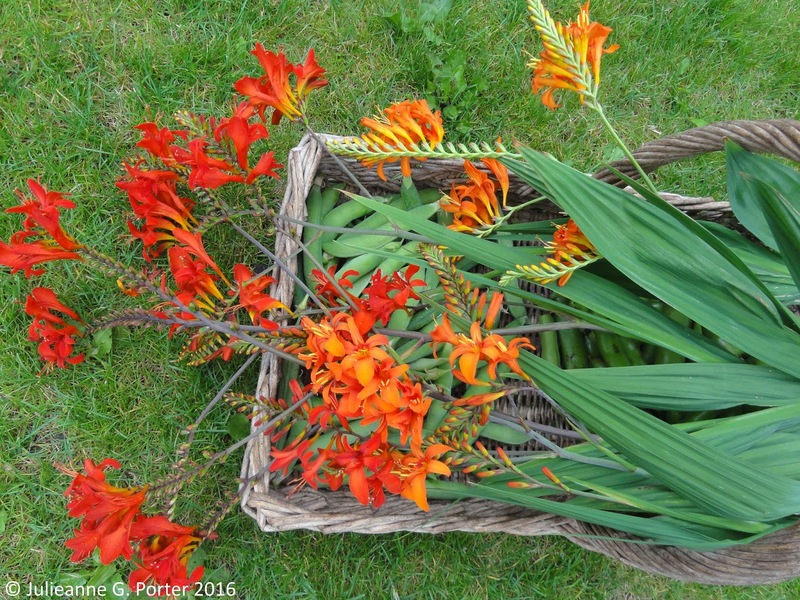 The orange flowers are Crocosmia. They used to be called Montbretia and there is an orange one that are known for spreading like you say. Mine are all named varieties, so thought they are bulking up, they don't spread wildly like the old orange Montbretia ones. Still, I love the old orange ones, so sunny and cheerful. It's been such an awkward year for growing. My pea crop failed completely. It didn't help that the rabbits chewed them all down to the ground shortly after planting! But I don't think I've had a respectable yield of anything much. You should give yourself a proper pat on the back. A really informative post, thank you! 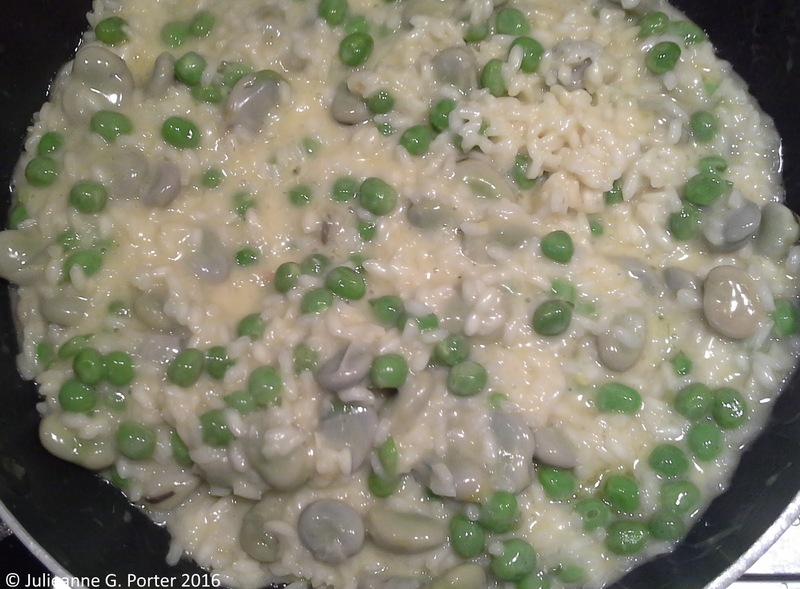 How do you manage the cooling/reheating aspect of batch cooking risotto without giving yourself food poisoning? Next year, I need to remember to save some energy for gardening at this time of year rather than doing too much in spring and then spending the rest of the summer recovering. I think that's one reason my garden seems to go on holiday in August! Lovely harvest blog :) It seems like you've done really well in the garden - it has been a challenging year, with the weather and the slugs - despite the ME. I'd be proud of your harvests, if they came from my garden! What a lovely harvest. I'm glad you were able to grow some peas, despite their higher spoonie rating – I know having fresh peas always gives me a lot of pleasure.